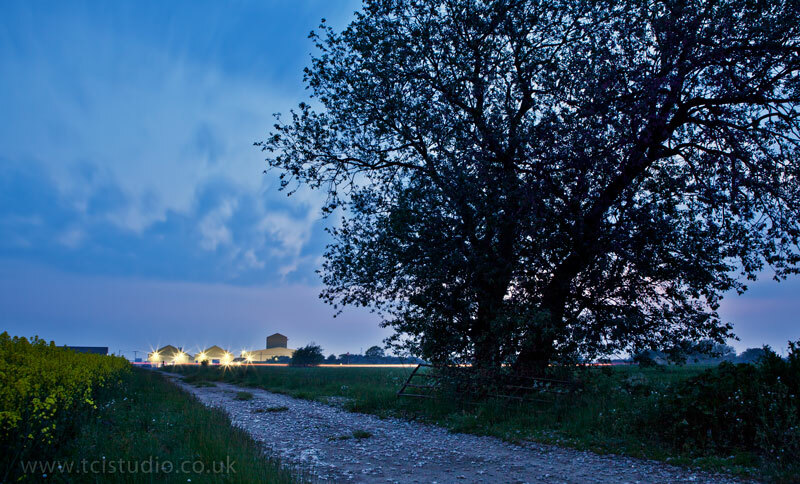 This image was created from a night shoot on Hadstock Airfield, Essex. The image is very close to the original exposure (around 4 minutes), I’ve just dodged in some areas and retouched a little to reduce slight noise in the sky then applied some curves adjustment to enhance contrast where needed. I wanted the tree and gate on first glance to look silhouetted against the sky, and the lights to form a focal point in the distance helping to separate the serene still foreground from the activity of the road and distant grain store. It was a still warm early summer evening and I’m happy that the image recreates the mood and atmosphere I experienced that evening.